The wide design of this acrylic sticker spindle rack allows you to display multiple different rolls of products on one display. The simple clear acrylic is a great choice for any retail area as it does not stick out, but it blends in seamlessly with its surrounding décor. 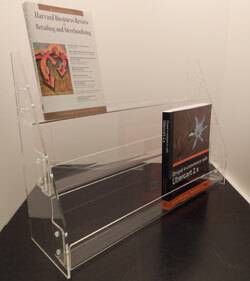 Flame polished edges are added to this acrylic sticker rack to give it a clean and professional finish. This product is also available for slatwall and gridwall. This acrylic earring display is available for gridwall or slatwall display. It accommodates 2" cards for carded earrings and measures 13"w x 14 1/2"h. Choose from the display options below. 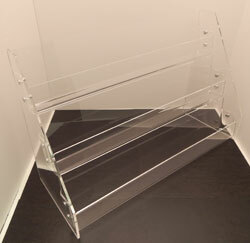 This 3-tier DVD or Card rack is constructed of clear acrylic. Available for counter top, slat wall, or grid wall display. Shelves measure 21"w x 1-3/4"d.
This gridwall acrylic card and CD display can really accommodate any small merchandise you wish to display. It features 3 shelves. Each shelf measures 21"w x 1 3/4"d. Easy assembly required.